Almost every cancer treatment available today has come about because of clinical trials. These carefully designed research studies test new treatments—such as cancer-fighting drugs—to see how well they work. 1. 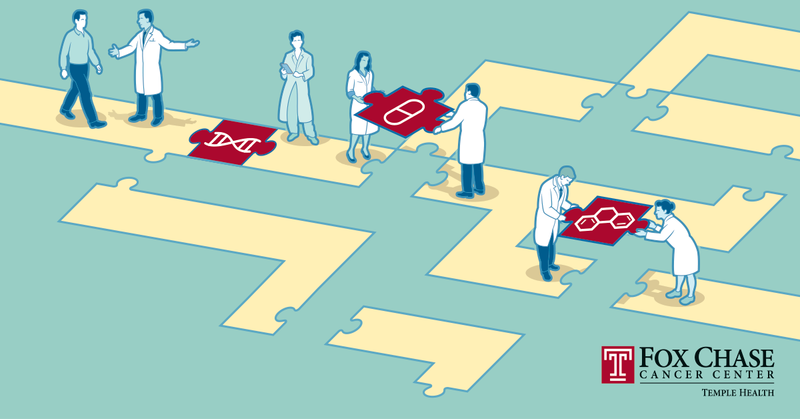 Clinical trials aren’t just for patients with advanced cancer. Today, trials are open to patients in almost every situation, including those with early-stage cancer. Some trials test new approaches to prevent cancer in those at high risk. Others investigate how to keep cancer from coming back. Major cancer centers, like Fox Chase, conduct hundreds of cutting-edge clinical trials, which means you’ll have the greatest chance of finding a study that matches your needs, no matter how early or advanced your cancer. 2. Every clinical trial has possible benefits and risks. You’ll have access to a new treatment that isn’t widely available yet, and you could be one of the first people to benefit from it. The research team will monitor your condition closely. You might help others with cancer by helping to advance research. Being part of a clinical trial may expand the number of treatments available to you. Being part of a trial doesn’t prevent access to standard of care options later – provided your health remains good, those options will still be there for you. As for the drawbacks: “Because a clinical trial is a research study, there are always unknowns,” Plimack said. It might turn out that a new treatment. Isn’t more effective than a standard one. Has side effects the research team didn’t expect, or the side effects may be worse than those that occur with standard treatment. Doesn’t help you, even if it helps others. Be aware, too, that participating in a clinical trial may require more office visits and testing—as well as time and travel—than standard medical care. 3. Placebos are rarely used in clinical trials for cancer treatment. 4. Costs are often covered. Insurers usually pay for the costs of standard care, Plimack said. And typically the study sponsor provides the new treatment at no cost and pays for any special tests, procedures or extra doctor visits. 5. Many people miss out on the potentially life-saving benefits of clinical trials. Fewer than 1 in 20 adults with cancer take part in these studies, according to the American Cancer Society. The main reason: Most people don’t know clinical trials are an option. If you’re facing cancer, ask your doctor if you might benefit from a clinical trial. You can also go online and browse through the clinical trials at Fox Chase that are currently accepting patients. One advantage of participating in a clinical trial at a major cancer center, is that the doctors conducting the trial are often nationally known for their expertise. For more information about clinical trials at Fox Chase—or to discuss your eligibility—call our Clinical Trial Office at 215-214-1515 during normal business hours.